I'm working on upgrading my current SS commuter to a fix/free. It is an old Miyata 1000 touring frame with a 'magic gear' that I ride on everything from pavement to singletrack. My plan was to braze on some track ends and do some upgrades to the bike. However, when I rode it to work this morning, it feels too small for me now that I actually have a mountain bike that fits me right. It's got a good height but about 2 inches shorter in the top tube than my MTB -- not good, especially since I want to switch from a flat bar to a swept-back bar. I'm thinking about replacing the frame with something else. This bike is for commuting, off-roading, and some SS touring as well. I'm not picky or anything. Surly Karate Monkey: Got one already, otherwise a great choice. Redline Monocog 29er: Awesome price, downside is too MTB-looking. Clyde-worthy? Redline Conquest: No track ends, could add them. Clyde-worthy? So, thoughts? Is there a frame out there that I am missing in my consideration? The Cross Check doesn't have true track ends, but the semi-horizontals function nearly the same way. Depending on crime in the area I would use the cheaper build for commuting. The Karate monkey (since you already have one) would be a perfect option. 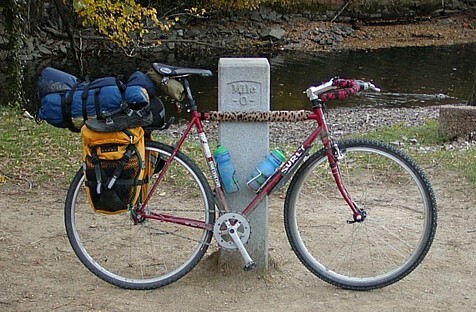 It has fender and rack mounts if you decide to go that route plus you can even go geared. Its not to expensive so crying will be limited if it gets stolen, and it is D U R A B L E (AKA reliable). This way you can give yourself a good excuse to spend more money on your new dedicated off road machine. Good luck. why do you not like the crosscheck dropouts... IMHO those are even better than track droputs cause you can change a wheel with fenders on your bike. My usual city bike philosophy is ride no bike worth anything, or at least appears to be worth anything. Thankfully, where I live now street theft is basically a non-issue. I would guess that 90% of bikes stolen are break-and-enter, while the other 10% happen at the high schools. I can get away with leaving my bike outside with nothing but a small frame lock, and it has some higher-end stealable stuff on it. You need to have a 3000+ bike to make it worth stealing, or either that or a garage full of nic bikes. The nearest market for stolen **** is about 2000 km away. Selling a stolen bike, or even parts, around town would be very difficult. It helps that half a dozen of the most diehard riders around here are RCMP. Anyways, I digress, but value of the frame isn't an issue so much as my budget. I could live with the non-track ends on the Cross-Check frame, I guess. It is a Surly and it also happens to come in the color (dark green) that I planned to paint the old frame. I just plain like the track ends, it is going to be sort of a retro bike: brooks sprung saddle, north road bar, classic saddle bag, that sort of thing. Plus I have a Tugnutt lying around looking for a purpose in life. The Rivendell Quickbeam fits the bill -- except for that pesky "low price" part. On-One Pompino with P-clamp mounted rack? The Rivendell Quickbeam fits the bill -- except for that pesky "low price" part. On-One Pompino with P-clamp mounted rack? Quickbeam would be perfect, your're right. Too much $$$. I hadn't considered the Pompino, but it has what I need and the price is definitely right. That might be the deal right there. 57 cm seems a little small for me though, considering I was looking at a 62 cm cross check. The top tube is pretty long though, I'll have to measure it against my current frame. Its not a Soma. I have seen these in person. No frills but not to bad. I actually prefer the cross check angled dropouts to the normal (level) track ends. The benefit is that you don't have to adjust the pads when you change the gearing. This is was a HUGE win in day2day week2week life. Wasn't sure about tire clearance on the Pake. Just throwing out other options. I had a cross check. Good solid bike for a fair price. Another vote here for you to take a look at the Rob Roy. Get over the idea that you need track ends and look at the Cross-check. It meets all of your criteria and will serve you well. I definitely don't need track ends, I just like 'em... But, you are right. I'm a huge fan of Surly stuff. I do like the Pompino and the IRO, but both are very hard to get up here where I live. I know someone who can bring in Surly frames, so I think that ease of obtaining one is going to push the Surly over the top, I think. Sweet ride. That is basically the exact bike I am going for, ss/fixie on/off-road tourer/commuter. I planning to ride moustache bars also. another vote for the cross-check. its just what youre looking for. Check out the bianchi San Jose (good thread in this forum back a ways). Track ends, rack mounts, bla bla bla, it has lowrider mounts in the front. I ride trail on mine, gonna hit it on the way home. Got a rack and run panniers sometimes, loaded cargo a lot. Fixie, Crossie, Pub Stunts, trackstands, back-flips, and so many hotties I can't swing a dead cat. ps some hyperbole in there, but generally an accurate (and precise) statement. good do all bike UNLESS one wants to run fenders. rear has to come off to remove the wheel on the jose. the fork is also a tad flimsier than the crosscheck... 'specially for cydes. I run phenderz no prob. If you have to carry around a 15 mm wrench for the wheel chances are you have a 3mm hex for the fender mounts too. didnt say it was a prob, just that it has to be done. no rack & pans and its a snap, but if running loaded pans it then becomes a REAL inconvienence. I was thinking of converting my crown jewel to singlespeed for commuting on. What kind of gearing do you guys ride? I am in NE GA so it's hilly but there aren't any death march climbs. Hills are fine, but you got to stay on top of them, especially with sneakers and toe-cages. My current SS commuter is a 40x18, which is overall pretty nice for riding a relaxed pace in street clothes. Based on that, I've spec'ed the new bike for 36x16 fixed and 36x18 freewheel. The fixed gear will be for commuting -- my daily commute is 3-5 km each way, mostly flat, and depending on which way I go includes roads, paved and non-paved trails and singletrack -- and the freewheel will be for more aggressive terrain, hilly road rides, or just when I'm tired or lazy. I realize most people ride taller gears on a fixie, but I'm not really into going fast and I want to be able to ride on and off road. This is my first time trying it though, so I may end up going a different route once I have some experience with the setup. I was thinking about 2.5 to 1 but I may come down a bit from there to start off.